Incident Details: A 10 year old boy, mountain biking with a school group, crashed whist descending the red route, and suffered what looked initially to be a serious injury to his lower leg. A Land Rover with 5 (one a paramedic) immediately left for the scene, and the Team Doctor attended direct, with a number of other members. 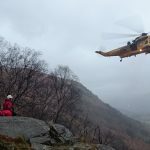 On arrival, the child’s injury appeared to be less serious than thought, and although the Great North Air Ambulance attended, it was decided that the boy could be transferred to the Cumberland Infirmary by road ambulance. The Team stretchered him down to a road ambulance which had driven up through the forest.